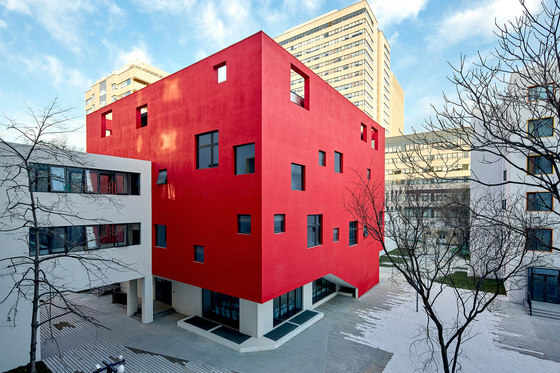 Chaoyang Future School, in Beijing, is the latest iteration of Peking University’s pedagogic model for China’s future creators, in their continued exploration with Crossboundaries to manifest places and spaces that embody their collective vision. 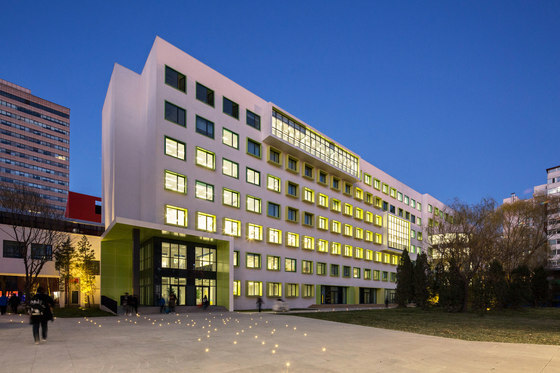 The large 26,000m² renovation of an existing educational campus built in the 1980s completely reassesses the landscape, façade and interior. 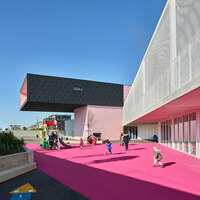 It uses color to negotiate from the urban scale to the human, and multifunctionality to assist both guided and passive learning. 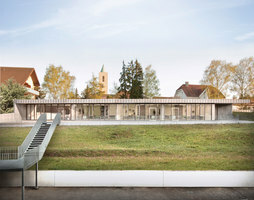 Densely arranged, the existing campus mirrored its tight urban surroundings. Inside its six buildings, faceless corridors were lined with rooms lacking identity or coherence. 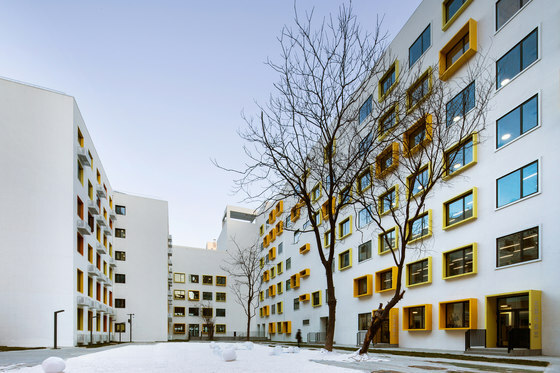 However, like the Affiliated High School before it – the first collaboration of Crossboundaries and Peking University– Future School needed to explore the demands of the school to serve the realm of a community. Learning doesn’t just happen in the classroom but throughout the campus, exponentially raising the value of this tight urban area. 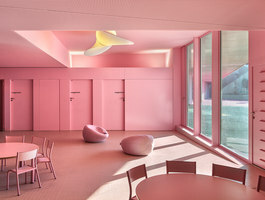 Formulating a crossover of the in and out and the public and private, the school creates a village that delivers to individual needs, catering to both students and teachers where they will eat, sleep, play, study, learn, and explore. Born of Confucius thinking the Chinese value system is centered on collectivism. Since China’s economic opening in the 1970s the nation's development has been nothing short of a race. Transforming its historically powerful workforce to engage with a global economy, the urgent call is for educational reform to deliver future generations to the stage as global actors. 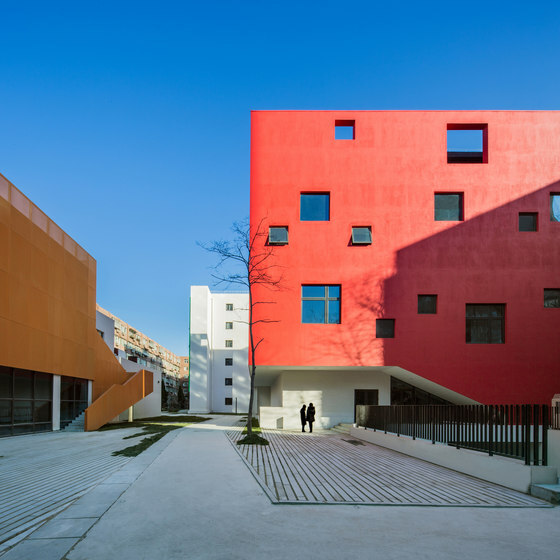 In this context, Crossboundaries responds to this by exploring the translation of China’s strong cultural history into a modern paradigm that develops independent thinkers and autonomous citizens – creating spaces that encourage and support their necessary interactions. The Future School campus and its educational methods are in need of an overhaul to meet these demands and be equipped for the future. While leveling the existing conditions of a pedagogy and an architecture is simpler than addressing them, the value added comes from navigating both. The nature of the built environment, education or any cultural institution, is inherited; by starting from and studying existing circumstance, Crossboundaries is able to translate its tested international approach to achieve a truly localized solution. For the Headmaster, the challenge of rethinking the nature of Chinese education is to resist the historical precedent to reduce to tabula rasa a rich collective knowledge in the name of progress and instead leveraging its own history to develop new methods. 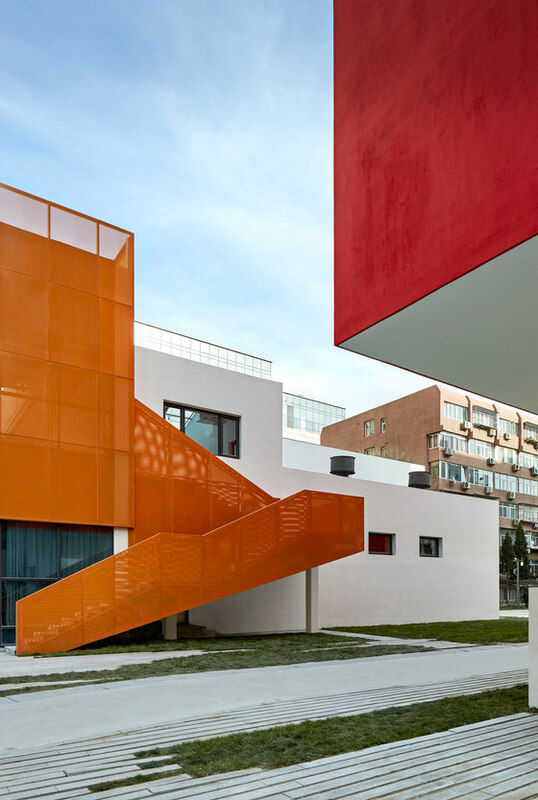 Crossboundaries’ objective works in parallel: to reuse and reimagine, adding to the ongoing lifespan of the existing buildings – to not only prolong their use but also restore their relevance and purpose. 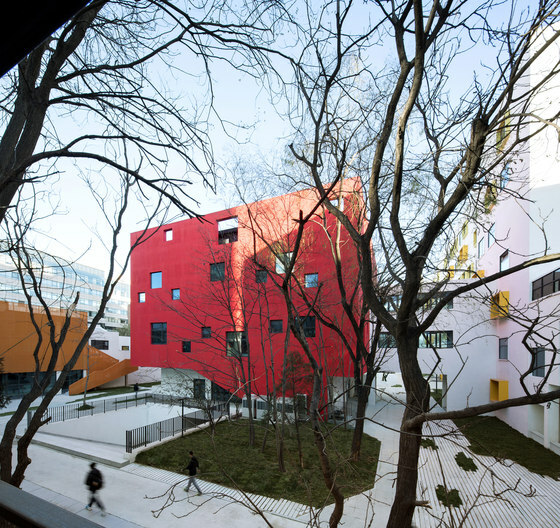 Crossboundaries implemented two key approaches in Chaoyang Future School: ‘the conventional’, the general upgrade of the out of date and degraded facility to a modern campus, and ‘the unconventional’ which materialized as multifunctional interventions. 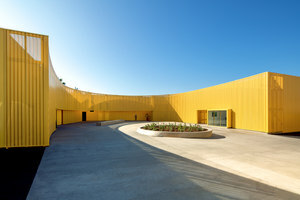 All of which attributes flexibility, interconnectedness and identity, the essence of the schools’ spirit. 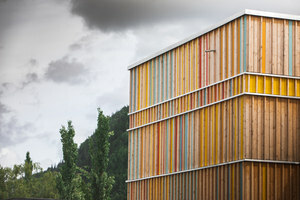 Color flows throughout the landscape, façade and interior. 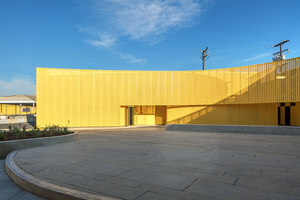 Beyond decoration, the gesture is the first layer of identity, orientation and a centering of the campus. 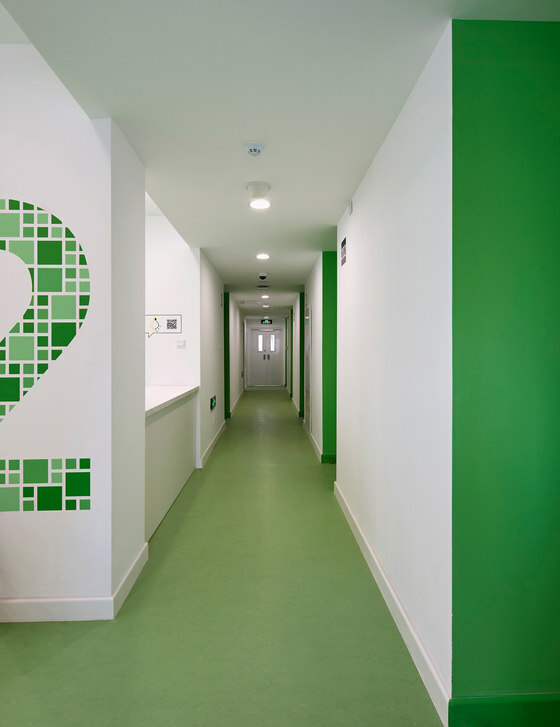 Inspired by the rich deciduous and evergreen vines that drenched the campus in its previous state, the color sustains the liveliness of its outdoor spaces and brings it deep into the activity indoors. 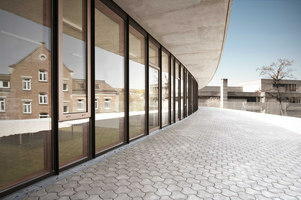 The clean white buildings are punctured with square openings, the rhythm preserved from the original building. 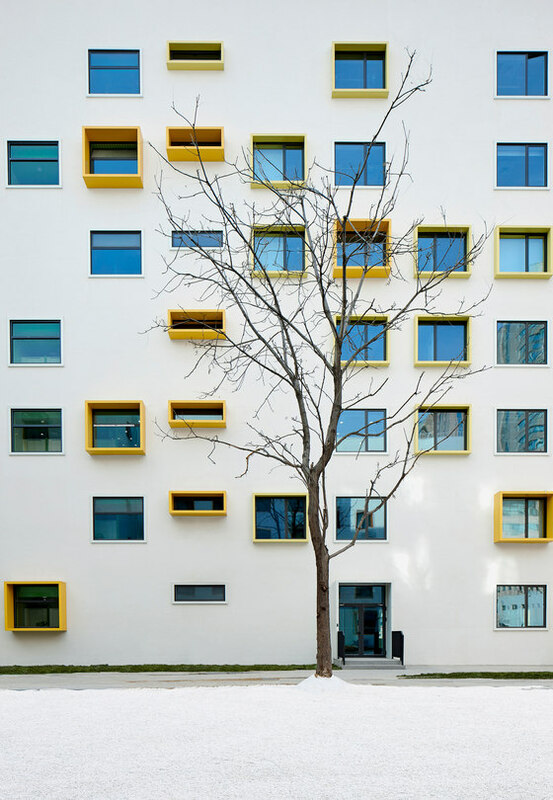 Their ornament creates an interface between inside and out – both for each building individually and of the campus as a whole. Window frames washed in green outline the public face of the campus, subtly fading yellow before warming to a deep red by the time they reach the campus center. 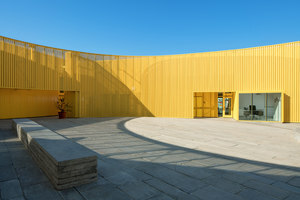 The openings ebb and flow in size, swelling to mirror the spatial links behind and broadcast an abstraction of their activities to the community around it. 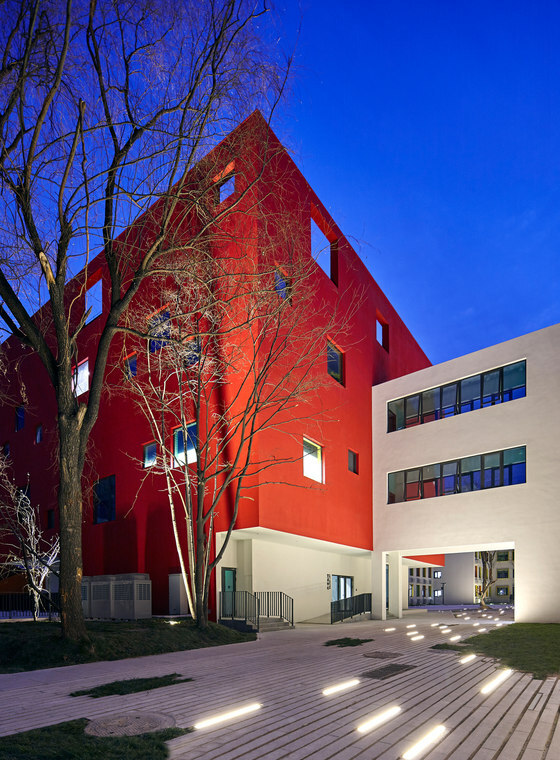 With a new face and its circulation reconfigured and the scarlet red Art Center is the heart of the campus. Meandering past it is the bright yellow running track, a path that ties together the existing with the lives of the new inhabitants - old and new, inside and out. This path rejects former conventions of separating functions and activities, achieving a new efficiency by more than doubling the length of a track in its default location. By marrying sport and exercise with diverse activities and academic subjects, it emphasizes crossover and collaboration at every scale. Even at the very edge of campus, a boundary fence becomes a space: a living interaction with the city beyond to serve both utility and play. The interior of each building is given freedom to breathe. Previously confined spaces are opened up with new connections that allow for activities and subjects to crossover. 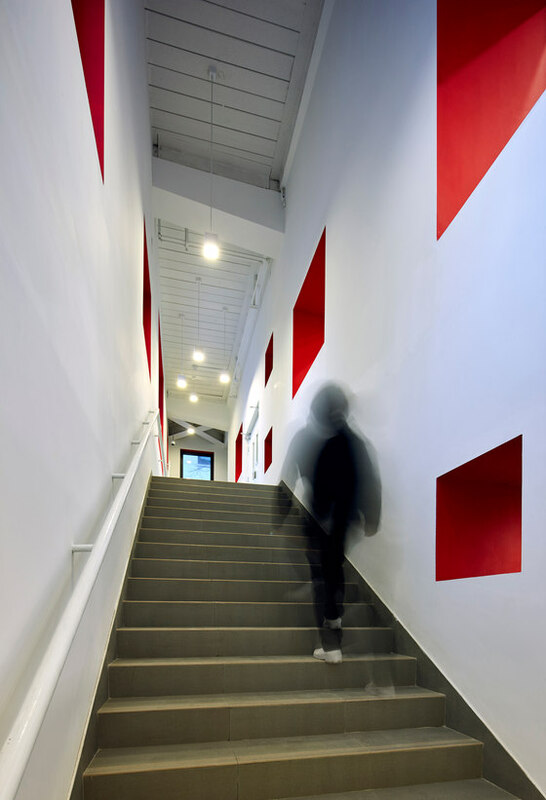 Architectural interventions open floors and walls to expand volumes and give way to new opportunities for creativity and inspiration. In the Learning Center, the existing classroom lined corridors at times become lined with glass and other times opened completely. New visual connections promote previously impossible user interactions. Subject-specific ‘islands’ develop several functioning zones out of a singular open space on each floor. 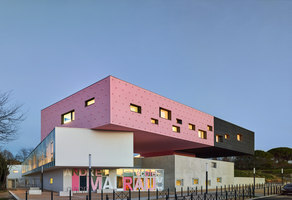 Vertical ‘bridges’ connect two floors with multifunctional activity spaces between related subjects on adjacent floors. 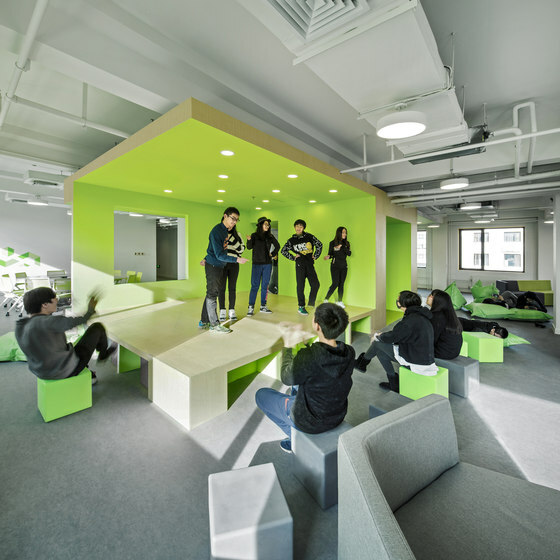 Each intervention works to dissolve the spatial boundaries of the buildings’ rigid structure and uniformity, producing collaborative learning spaces bolstered by user-defined furniture. 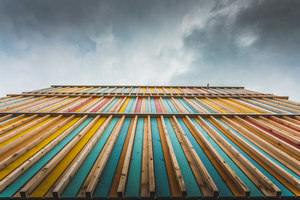 Once the changeless box, the “classroom” has outgrown the institutional system – the factory for educational conditioning yielding a standardized product. Led by students and teachers together, it now offers them the ability to claim command of its space and interpret how best to use their time together. 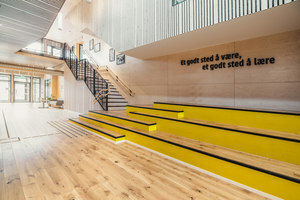 Interactive and adaptable interventions connect and respond to the users, a hallmark of any design developed by Crossboundaries. Each campus building provides the user new opportunities and possibilities to interact, discuss, collaborate, create, and explore. The collaborative renovation brings to life every element of the program. 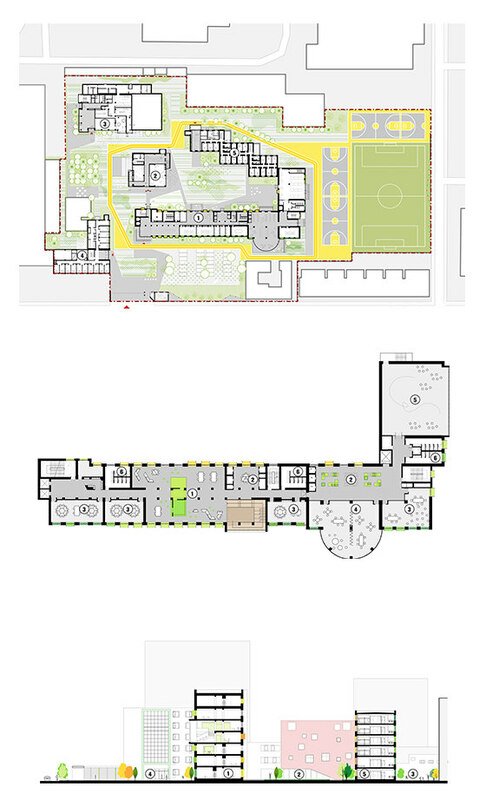 From each traditional learning space, across the landscape and administration, into the apartments and the canteen that delivers more than food, the design optimizes spaces and endorses a campus life that facilitates continuous learning around every corner. 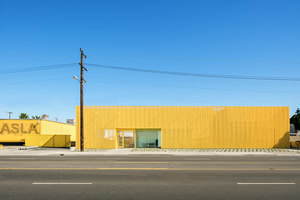 Each building holds its own unique identity while maintaining a common mission. 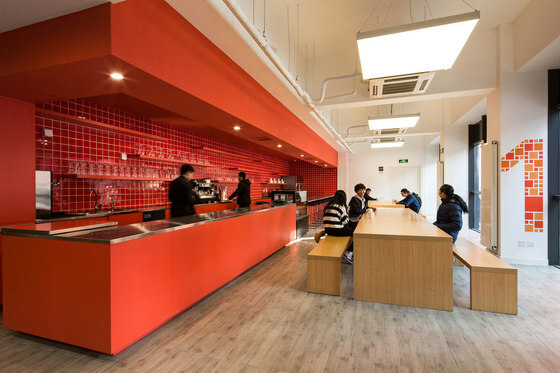 Each space employs color for identity and orientation, user-defined furniture and inspiring signage to encourage its creative use. 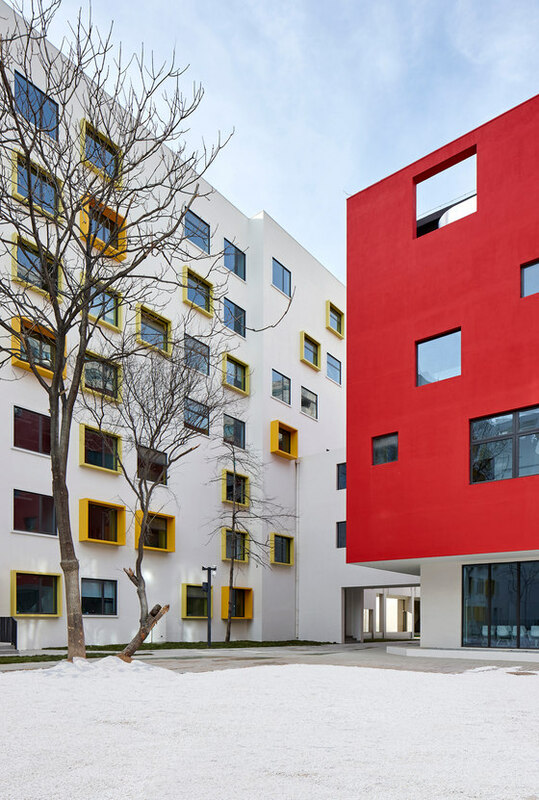 Chaoyang Future School demonstrates not only the potential of reuse but also a reminder of the responsibility to work resourcefully – to engage the embedded values of the existing, whether they be social, economic, or environmental. 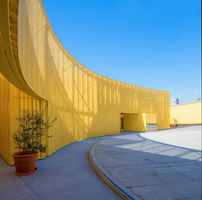 The spirit of flexibility, interconnectedness and identity generates more than new uses, functions and values – it represents an evolution within the lifespan of a building and the resilience to adapt over time. 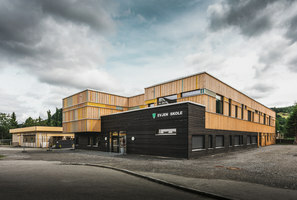 Now open, Future School has begun a new journey with a renewed relevance: to guide a community, shape and inspire new lives and leaders, and stand the test of time. Contractor: China Building Technique Group Co., Ltd.